This article was originally published in PaymentsSource and is republished here with permission. It’s no surprise that brands have often focused their strategy on where they hope their customers will engage, rather than make use of current data that reflects where customers actually spend their time. And with stagnating app usage among other challenges, brands do this at the risk of reaching a small portion of their customers, as well as losing their customers altogether. Yet, a different approach has now taken hold that moves beyond the app to enable companies to reconnect with customers in more powerful ways. Cross-channel mobile marketing allows mobile marketers to take advantage of a wider range of channels and better draw on each of their unique strengths. The result is a more rounded and dynamic mobile experience that is able to reach a more diverse group of customers through multiple touch points. Moreover, the cross-channel marketing approach is one that complements the app rather than replaces it. Although some companies have started to integrate cross-channel marketing as a core element of their strategy, most still haven’t realized the opportunity at stake. Our research revealed that, above all, mobile pass for wallet and text messaging are two underutilized channels that offer companies a huge opportunity to engage customers. As our findings below show, these two channels will serve as valuable assets for which brands must have full strategies as app usage continues to stagnate. While a brand may be able to get consumers to download their app, it’s much more difficult to persuade consumers to actively use or even keep the app. In fact, it turns out that 90% of app users abandon or delete apps within the first 30 days of downloading. While some brands are beginning to increase their cross-channel marketing to adapt to these changing consumer characteristics, most still haven’t realized the opportunity at stake. So, to shed more light on this, Syniverse’s studies aimed to gain a more detailed perspective on some of these characteristics and some of the richest areas of cross-channel marketing. We found that mobile pass and text messaging are two underutilized channels that offer companies a huge opportunity for engaging customers. Let’s take a closer look at the implications for each. Although mobile pass is available on 90% of smartphones now, it’s been an underused tool for many years. But it’s now come to the forefront as a well-suited complement to apps. With its unique capability to deliver coupons, rewards, tickets and other items straight to a user’s mobile device, at a place where they can easily be retrieved, mobile wallet offers incredible potential to open new levels of customer engagement. Two-thirds of respondents in the U.S. said that they are aware of mobile pass. And of the consumers who have mobile pass, 53% said they use it once a week, and 28% said they use it once a day. These adoption rates point to significant potential for brands, compared with the average rates for app usage. As one example of this potential, Chipotle Mexican Grill launched a mobile wallet campaign when it had to close all its locations for a company-wide meeting. For customers who visited a store that was closed, Chipotle offered those customers a free burrito, redeemable through a mobile wallet coupon. The restaurant set up window signs urging customers to text a number to receive a coupon, and the response rate was unprecedented, with about 5.3 million people requesting the offer, and 3.5 million people redeeming it. 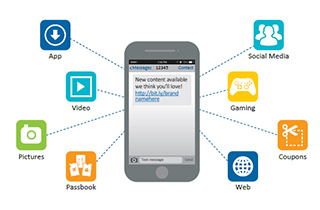 At the same time, messaging continues to be a traditional workhorse of mobile engagement. Critically, it still offers the one ubiquitous channel that all mobile users can reliably communicate through, regardless of device or network. The app has been a mainstay of mobile marketing, but stagnating app usage and changing mobile consumer patterns now require for a new strategy. Cross-channel marketing offers a fresh approach, and as the distinct capabilities of such channels as mobile wallet and messaging show, it’s an approach that brands must begin taking advantage to more dynamically engage their customers. Is Marketing the New Customer Service? « 5G Is Born at the Winter Olympics!